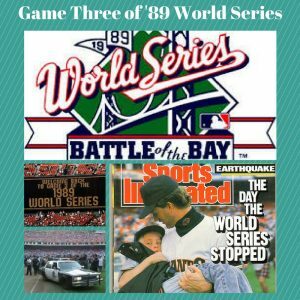 Game three of the 1989 World Series occurred on October 17th. The Oakland A’s had won the two previous outings but the Say-Hey-Kids of the City knew better than to count themselves out. Then it happened. At 5:04 p.m. Candlestick shook under the wagging finger of a 6.9 jolt. And it was all caught on live T.V., a first. 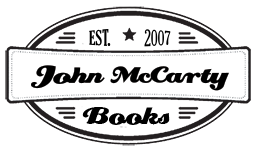 Al Michaels cut in on Tim McCarver’s highlights to say, “You know what, we’re having an earth…” and the feed went dead. 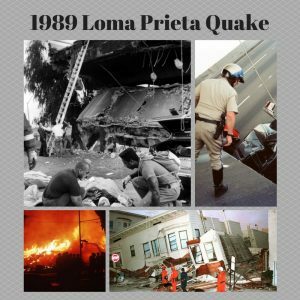 The 1989 Loma Prieta earthquake occurred in northern California on October 17th at 5:04 p.m. At the time my wife and I were living part-time on a boat in the Marina District of San Francisco. Huge support poles for the docks and ships’ masts began to crisscross each other. A lady screamed from Marina Blvd. Cars crashed. Honks blared. Propane tanks exploded. Flames shot up. I left a blank T.V. & the World Series behind and went to the parking lot where everyone gathered around a pickup and its radio. Broadcasters sent out alarms, stating that the downtown was buried under eight feet of glass, that the Bay Bridge was down, that the Nimitz Freeway had collapsed.